4 issues for only $49.95—a one-year subscription. Call 800.733.6786 for bulk discounts. 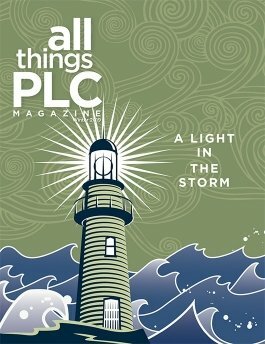 Rely on AllThingsPLC Magazine to fuel your PLC journey. Each issue of this PLC magazine includes a unique mix of inspiration, fixes, how-tos, and tips that will maximize your efforts toward establishing and maintaining a high-achieving professional learning community. With print and digital versions available, you can access this dynamic quarterly publication whenever, wherever you want: in print, on your desktop, or with your favorite mobile device. Get advice and insights from PLC thought leaders, including Robert Eaker, Mike Mattos, Anthony Muhammad, and Tim Brown. Access in-depth professional learning community articles, case studies, websites, books, and other resources to strengthen your PLC and professional development for teachers and educators. Read engaging, personal commentaries from educators who have implemented the process to great success. Gain specific, proven strategies that foster a culture of collaboration and higher learning in schools and districts. Purchase your subscription today, and we'll send your first issue as soon as it is released. The delivery of your first issue depends on your purchase date (see FAQ for more information). The print edition is available to ship within the United States only. Bulk print orders can be shipped to central offices and school buildings only. We are unable to accept returns or cancel previously placed orders. How do I access the digital magazine? Once you have purchased* a digital subscription and your first issue has been published, to access your digital issue, log in to your account on SolutionTree.com. Once logged in, click on “My Account” located at the top of the screen—this will take you to your dashboard. Then click on “AllThingsPLC Magazine” on the left-hand side of your screen. If someone purchased your subscription as a part of a bulk order, please retrieve an access code from the purchaser. Solution Tree will provide the purchaser with access codes when the issue has been published. *Please Note: For check or purchase order, the order submitted online will not be confirmed until Solution Tree receives the check or a copy of the official signed purchase order. Your purchase order must note payment terms of net 30 days. We cannot process purchase orders that do not note these payment terms. Please submit all payments to orders@SolutionTree.com. What if I have trouble accessing the digital magazine? Call 800.733.6786 Monday through Friday, 8:30 a.m.–5:30 p.m. ET or email orders@SolutionTree.com. What are the technical requirements for accessing the digital magazine? Internet access and a PDF reader is required. High-speed Internet access is best for viewing image-rich PDFs. The PDF is compatible with most browsers.